While most venture north to Jasper in the summer to hike through the magnificent Rockies, there's plenty to do in Jasper in the colder temperatures. 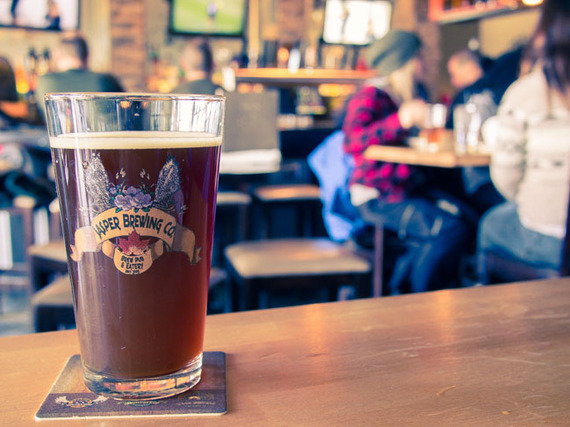 And after the skiing, snowshoeing and dog sledding, downtown Jasper is home to many cozy places to warm up on winter nights. A franchise restaurant with a few locations in Canada, the Famoso Pizza Jasper location was started by locals yearning a taste of Italy, cooking delicious Neapolitan pies at 900F for 90 seconds in an authentic bell oven. Pizzettas are the perfect size for kids but as a licensed restaurant adults can still enjoy a glass of wine. Brewed in a Jasper National Park with water sourced from The Rockies, Albertans drive four hours from Edmonton to stock up on Jasper Brewing Company's delicious Blueberry Vanilla Ale. Premium beer is brewed on site and paired with a great pub menu, making it the perfect place to watch a game or catch up with friends. Evil Dave's Restaurant is known in town for its innovative, globally inspired food with quirky names like Holy Cow and Hell's Chicken. You can relax knowing Evil Dave is no longer around but local owners and cocktail connoisseurs Mike and Cyndi will ensure you have a great time. With a cozy lodge interior and long standing history, Papa George's Restaurant has been serving Canadian cuisine since 1925 featuring adventurous fare such as Alberta elk medallions, wild game burger and rabbit. Fridays from 6-8 p.m. owner and sommelier Patrice Fortin offers wild game and wine pairings for only $35. For more information on what to do in Jasper check out A Winter Guide to Jasper.